Providing you the best range of swing door cupboard with 4 shelves 50 box files capacity and swing door cupboard with effective & timely delivery. Dual Purpose Shelves - These can accommodate box files as well as lateral pocket files. Adjustable Shelves - Easily adjustable shelves at 20mm pitch. European Lock -European design lock with handle. For easy operation. Flush handle locking with fold-able keys. 40 kg load carrying capacity per shelves. 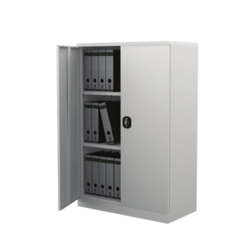 We hold the expertise to offer a range of Small Swing Door Steel Cupboard. These products offered by our organization are procured from the international markets and are made using high grade raw material and latest technology. Our products are manufactured as per the international parameters and are provided as per the set norms and standards. These products widely appreciated for their stronger construction, water resistance, spacious inside and proper handles.